Project Management or Process Management? Project Management or Process Management? There is quite a bit of confusion and contention in the business world surrounding these two terms. Understanding the difference between these two management styles is crucial because there is a time and place for each method and each method requires a specific skill set. First, let’s define project management. According to the Project Management Institute, a project is “a temporary endeavor undertaken to create a unique product, service or result” and project management is “the application of knowledge, skills, tools, and techniques to project activities to meet the project requirements.” Key terms in these definitions are “temporary” and “unique.” Projects have defined deadlines with clear start and end points and are designed to be specific to the product or service in question. Project management has a definite emphasis on achieving the end result. Process management differs from project management in that processes are not meant to be temporary or unique. Processes do not have set starting and ending points in time and are meant to be repeatable. Process management involves careful planning and continuous monitoring of the performance of a given process to ensure quality requirements are met. 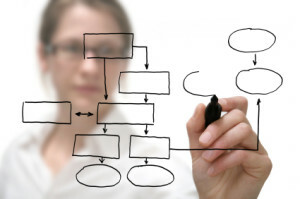 Change, improvement, and re-engineering are all important components of process management. Process management has an emphasis on improving efficiency and improving quality. Both process improvement initiatives and projects have measurable parameters (scope, budget, schedules, requirements, objectives, etc.) which should be established before launching. There is, of course, some overlap between the two styles when played out practically in a business setting. Managing a project is in itself a process, involving a consistent series of steps taken to ensure that the project is successful and meets the given requirements. The difference is that within a project management framework, the process is not changed, altered, or analyzed for improvement. The idea is that if the project management method, that is, the established process, is followed, the project will successfully meet its defined goals. Process management recognizes that all work and all projects ultimately involve some sort of process and advocates for continued monitoring and development of those processes. This management style need not compete with project management, but rather, ought to complement it. If you are trying to complete a temporary and unique task, you need to focus on project management. If you want to evaluate and improve repeated, ongoing tasks, you need to focus on process management. Before choosing a management style, take time to think about whether you are working on a project or a process. Then, take steps to equip your team with the best tools. Lean Six Sigma training is one great way to arm your management team with the tools they need to analyze and improve processes, which ultimately ensures more successful projects.